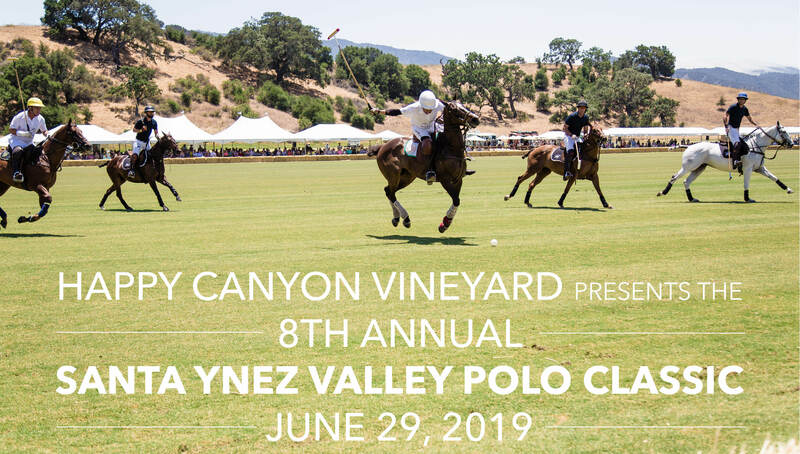 The 8th Annual SYV Polo Classic is returning to Piocho Ranch at Happy Canyon Vineyard in Santa Ynez with the same smaller playing field and fast, action-packed polo. All guests are invited to dress for the occasion, with creative hats for the ladies encouraged. At the conclusion of the featured match, an awards ceremony is conducted at midfield for guests to gather, mingle with the players, and view the presentations of the perpetual winner’s trophy, Carlos Gracida Sportsmanship Award, Best Playing String of Ponies, and Best Playing Pony. VIP guests, including Patrons, Sponsors and individual VIP ticket purchasers, will once again be treated to private tented seating and dining area, champagne and appetizer reception, entertainment, three-course luncheon, goody bag, silent auction, and the ever-popular hat contest. Happy Canyon Vineyard Wine Club, exclusively for Wine Club members and their guests, will offer private tented table seating, buffet luncheon, wine, and limited bottled beer. Figueroa Mountain Brewing Company Beer Tent, will offer private tented table seating, lunch from a gourmet food truck, bottled beer, sparkling wine, and limited wine. Tickets are open to the general public. General Admission tickets include admission only. Lunch options from gourmet food trucks, beer, wine, sparkling wine, soft drinks, and dessert will be available for purchase. There will also be a hat contest for Club and General Admission guests. All tickets can be purchased with bus transportation from stops within the Santa Ynez Valley, Santa Barbara, Santa Maria, Arroyo Grande, and Westlake. Prices for transportation are posted on the ticketing website and vary by point of embarkation. *All bus tickets must be purchased ahead of time. Guests will not be allowed to buy tickets day of event. *Please notify us if you have any mobility/wheelchair needs.